POSTED August 2, 2018 12:41 p.m.
John Rupp used to spend a lot of time outdoors before the accident that changed his life. As a farmer and sportsman, he worked up and down the hills of southwestern Wisconsin for five decades. Working hard and playing hard, he enjoyed breathing the fresh air and feeling the burn of sore legs as he walked into the Rupp family home at the end of a long day. Fall harvest time was demanding. Farm work and family were top priorities. Hunting and fishing had to take a back seat. Winter allowed more time for hunting rabbits, one of his favorite pursuits. He would repair equipment or take care of some other farm chores that had fallen to the bottom of the To Do list during harvest time, and then he would go hunting for a variety of tasty game with friends and family. “We hiked a lot of miles back then,” he recalled. After hunting season, spring tilling and planting kept him hopping. During the summer, once a week, he would join his fellow members for a round or two of trap shooting at the Izaak Walton League of America (IWLA) Southwest Wisconsin Chapter’s club grounds between Cuba City and Shullsburg. He enjoyed the camaraderie of local members and shooters from Platteville, Darlington, Lancaster, Hazel Green, Potosi and across Iowa, Grant and Lafayette Counties. He could walk down the hill to the range, break clay targets and enjoy burgers, banter and beer with his fellow chapter members and his family. Year after year, the rhythm of the seasons provided a predictable security. The foreseeable future seemed fairly certain. Rupp was stacking big bales with his tractor’s front-end loader. There was no cab, no cage, no protection. His son watched as he put the last bale on top of the others. It wasn’t lined up just right, so he pulled back enough to reposition and nudge it into alignment. It rocked and, before he could escape, the massive bale tumbled onto him, breaking his back and paralyzing him from the chest down. The tractor kept rolling backward, out of control, with a driver who could not work the foot pedals. His son came to the rescue, stopping the machine, but the damage had been done. Rupp’s life changed forever, along with the lives of his family and friends. The healthy, middle-aged outdoorsman had to re-learn the basic tasks of everyday life, and to live it in a wheelchair. He wasn’t accustomed to living with limited mobility. After a while, he mastered his life’s new routine and pushed himself to get back to hunting and target shooting, sometimes feeling like he was a burden on his wife and his adult boys who helped him do things and go places he was no longer able to enjoy independently. “It’s good to still be here, surrounded by family and friends,” Rupp would say, counting his blessings. Rupp’s life changed again recently, for the better. He finally accepted an invitation last winter to hunt rabbits with the IWLA chapter’s President Dennis Carpenter, Vice President Harold Peart and member Donnie Shireman. Rupp’s son drove him to hunting property in Hazel Green and transferred him to his wheelchair. With a bit of effort, he or his son would position Rupp’s wheelchair so he could shoot safely. The chair’s skinny wheels were not made for snow, mud or other obstacles. Peart’s beagle chased bunnies all day, and most of them ended up on the dinner plate, but two things from that day stuck out in Rupp’s mind. First, he was reminded of how much he enjoys being outdoors with friends and family. Second, he needed to figure out a better way to maneuver afield to increase his fun and success. 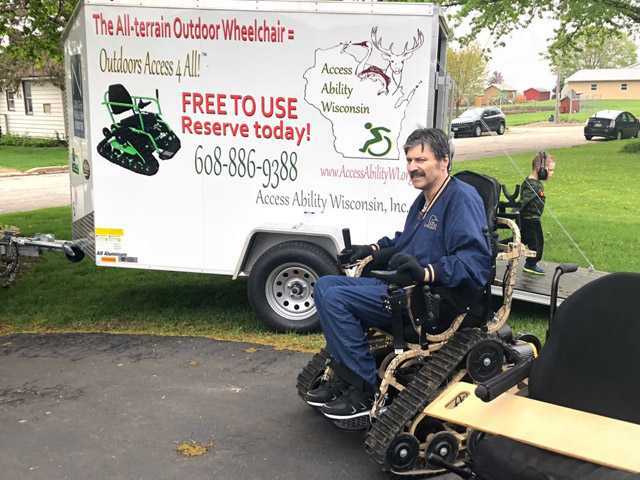 Witnessing the challenge on that hunt, one of the members contacted AccessAbility Wisconsin, a non-profit group that owns and operates an all-terrain wheelchair loaner program. AAW, which is run by Monica Kamal, was expanding its fleet from three to 12 chairs, eventually hoping to put a chair in each of the state’s 72 counties. The Outdoor Heritage Education Center organization near Rupp’s home agreed to host one of the chairs, the first in southwestern Wisconsin, and arranged for Rupp to coordinate its free rental use. It’s available free to anyone in this part of the state. They offered to let him use it whenever it was not being rented for the week or weekend. He accepted. The Action TrackChair, enclosed trailer and charger arrived at Rupp’s home in May, and he fell in love with it and the freedom it represented. His grandkids think it’s pretty cool. And it’s fun for grandpa. Picture a five-speed wheelchair with tank-like wide rubber tracks on each side, controlled by a hand-size joy stick on the chair’s arm rest. On-board batteries and dual electric motors with a charger and inverter provide plenty of power. The chair plugs into a regular outlet for recharging right in its trailer. Recently, Rupp met Kamal, AAW volunteer Ray Anderson and Chad Hermanson, who sells the chairs, at Rupp’s old stomping grounds. They gathered at the IWLA chapter’s range for a round of trap, which is not an easily accessible trap field because of grassy hills and gravel parking lot. Rupp brought the chair. Kamal and Hermanson brought their own all-terrain chairs they use for hunting and other outdoor adventures. The three shooters navigated their Action TrackChairs easily. Local UW-Platteville Pioneer Sportsman’s Club students Lexi Fladseth and Tyler Buchanan joined them, along with former coach Scott Sandholm, Marion and Eric Lovell, and others. They were like any other trap shooting group, with plenty of fun and frustration as each shooter tried to break more birds than their average score and more than their new buddies broke.